Definition: Middle ear trauma due to rapid & marked decrease in middle ear pressure. Gas must move freely between the middle ear and nasopharynx in order to maintain equal pressure on both sides of the tympanic membrane. During ascent: atmospheric pressure decreases so middle ear pressure becomes relatively positive this is corrected by passive outflow of air from middle ear along Eustachian tube (E.T). During diving & airplane descent: atmospheric pressure increases so middle ear pressure becomes relatively negative this can be corrected only by active opening of E.T (by swallow) to allow air inflow to middle ear. So otitic barotrauma occurs when E.T fails to open, this results in retraction, rupture, and effusion. Earache, discomfort & fullness in ear. Retracted congested tympanic membrane (T.M). 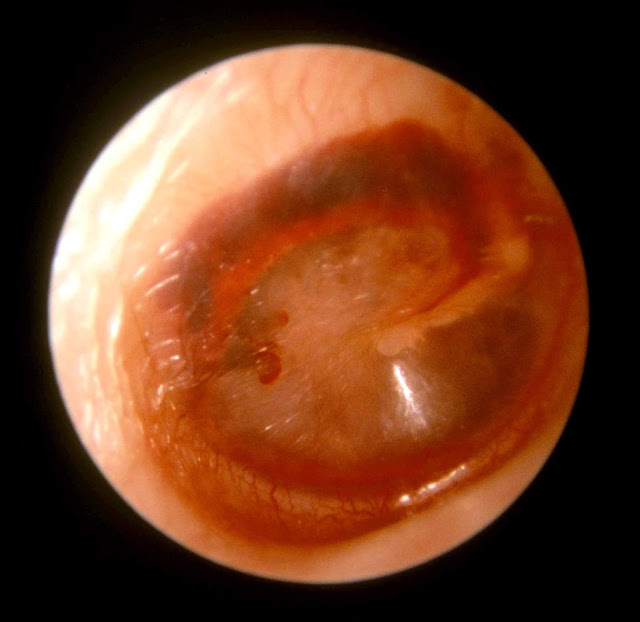 Middle ear effusion (may be haemotympanum). Tuning fork: Conductive deafness (C.D). 1- Avoid flying with common cold. 2- Avoid sleep during descent. 4- Nasal & oral decongestants.